With it being winter time in many parts of the world, and with holidays just around the corner, we thought we’d share this article to warm you up! We’ve talked about our epic adventures that are on our travel bucket list, but even though we love intrepid trips, we also love relaxing on pristine beaches! Our favourite stretches of sand so far have been in Mozambique, Cambodia, Grenada, and the Grenadines, but there are many more that we still have our eyes on. There’s just something magical about being in the tropics. Although this list of beach destinations may not be the most affordable places to visit, we can dream, right? This island is located in French Polynesia in the Pacific Ocean. When we think of Bora Bora, visions of bungalows set on stilts over a glass-calm lagoon come to mind. I doubt that we’d do much more than relax and enjoy the views of the crystal clear waters from our little hut…but isn’t that the point? Nick would probably head out on a couple of scuba dives and I may do some snorkelling. This atoll is surrounded by a barrier reef, with sharks and manta rays frequenting the waters. In all of his years of diving, Nick has never seen a Manta Ray! It would be amazing if he could see one here. Hawaii is located smack dab in the middle of the North Pacific Ocean and has long been on our list of places to see in the world. I think the reason we haven’t been there yet is largely due to the cost – it’s not exactly budget friendly. However, all money aside, it’s somewhere we’d love to visit. The topography comprising this string of 8 islands is incredible and there is an endless list of things to do. Surfing, scuba diving, snorkelling, hiking, swimming and visiting waterfalls & volcanoes are just some of the many things we’d like to do there! On top of the activities and beautiful landscapes, we’d love to experience a traditional Luau and sample the authentic food. Ever since a friend of mine won a free trip to Fiji from a grocery store in Calgary, Canada (I know, can you imagine? ), I’ve been dying to go to this tropical island in the South Pacific. More recently, we’ve been following Ryan from Blogging From Paradise, who was living in Fiji, house-sitting with his girlfriend. From reading his articles and hearing him talk about his passion for that little country, we became hooked. There are over 333 islands to choose from, but we’ve heard that the city of Savusavu on the island of Vanua Levu and Mamanuca and Yasawa Islands are must-sees. This little nation is composed of 26 islands and it has been on our list for quite some time. When we were in India and Sri Lanka in 2009, we considered taking the quick flight over to the Maldives, but didn’t for some reason and now are regretting it! With a ground elevation of only 1.5 meters, this is the lowest country on the planet, and the smallest nation in Asia. Regardless of its size, it’s beautiful and has a lot to offer the vacationer. We’d love to visit the Islamic sites, Nick would love to scuba dive there and I’d love to go snorkelling…as well as just lounge in my hammock sipping on cocktails! Located in the Bay of Bengal between India and Myanmar, this is another idyllic string of islands. Actually, there are over 500 of them! Once occupied by the British during colonial times and by the Japanese during WWII, this is an island nation that is not only beautiful, but full of history and sites. We’d plan to see the Victorian English ruins, the Indian navy museum and the former British prison. Of course, we’d also want to hike to waterfalls, walk through the jungle, laze on beaches and enjoy the wildlife. We’re not sure how or when we’ll get to these ultimate vacation destinations, but we’re hoping it’s one day soon. Perhaps we’ll be offered a house sitting job, or will be invited out by the tourism board to promote their countries? Who knows…we’re open to anything and everything, these are the luxurious destinations we’ve always read about in magazines, and we’re definitely interested in going! What about you? Have you been to any of these incredible countries? I’ve only been to Hawaii, but it’s a perennial favorite of mine. I especially loved Molokai – it’s more wild and has far, far less tourists:) After reading this, I want to add the Andaman Islands to my list. Thanks for sharing about the less touristy area of Hawaii! It’s high on our bucketlist and hopefully we’ll get there soon. We loved the Maldives, though I am pretty sure it basically ruined any other beach destination ever for us. It’s that fabulous there! That’s awesome that you guys have been there though! We’re so regretting that we didn’t go when we were in India. Oh well, It’s still on the list and hopefully we’ll get there soon. All great destinations, albeit I’ve only been to the Maldives and the Andaman Islands. That’s awesome that you’ve been to two out of the five on our bucket list! I completely understand how you wouldn’t have beaches on your dream list – to each their own! We also have adventure bucketlists, trekking bucket lists, etc. So, we’re with you, love mountains as well! I have the exact same bucket list! Hailing from Western Canada, we have so many friends who have been to Hawaii and we love the fact that it is picturesque but also has so many other things to see and activities to do. One day…one day! It must be a western Canadian thing then!! Can’t wait to get to these awesome places. Nope, sadly! I really want to visit Niue, and also keen on the Maldives, and Tahiti or Vanuatu. Ah, can’t wait to get to those awesome destinations! Oh, I’ve too been thinking of many of these! If only they were just a teensy bit closer/didn’t take so long to get to! But then I guess they wouldn’t be so pristine, either. Someday…. True, I think that’s what keeps these places so pristine – you have to really want to go in order to get there! But, we’re willing to take the long flight 🙂 haha. Yes, I certainly am detecting a theme here – pristine beaches in the tropics, as you say!! 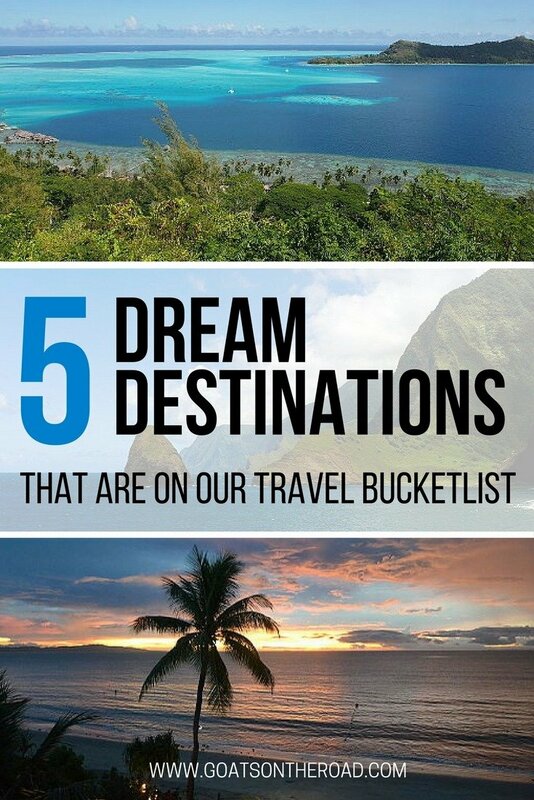 I can’t blame you though – these are some fine bucket list destinations! Love, love, love the tropics! However, we also love mountains..hm, another bucket list perhaps? haha. Thanks for the comment Tim. Happy New Year! Excellent!! Always looking to save money 🙂 Thanks for sharing the article, we hope to get to the Maldives sooner rather than later! I’ve been to Tahiti (including Bora Bora), Hawaii (all major islands that allow tourists), and Fiji (Viti Levu and Mamanuca Islands), but would love to make it to the Maldives someday. My immediate bucket list includes Colombia, Ecuador (including Galapagos Islands), Bolivia, Chile, Antarctica, Bhutan, Nepal, Myanmar, Laos, and Indonesia (especially Bali). …and oh, yeah, some of the deeper Eastern Europe countries–so I’ll be looking forward to hearing about your trip there!